Lightning in hurricanes is rare. When it occurs, it almost always means the hurricane is strengthening. I caught this image at 9:45am. It appears the eye is going to reform into a better, more concentrated structure. This is confirmed on the satellite imagery as the coldest cloud tops are now wrapping around the eye. The image below is from 9:49am. The central pressure, as the change in the eye occurs, has gone up to 949 mph as of 9:38am. I suspect once the eye rebuilds the pressure will drop rapidly and winds will increase. Maximum sustained winds at the present time are 110 mph. The storm is forecast to remain at tropical storm strength (40mph through Wednesday). Here is the latest track forecast. 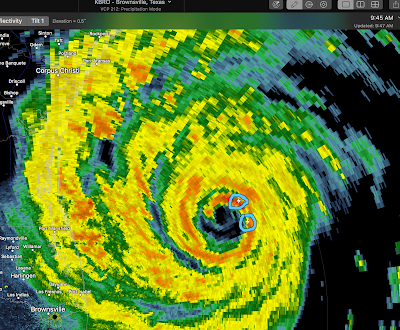 Note that the tropical storm force (~40mph) winds are just about on the coast (orange tint). The hurricane force winds are the brown color. The size of the hurricane force winds will grow a bit before landfall. As noted previously, I believe the speed of the winds will increase. 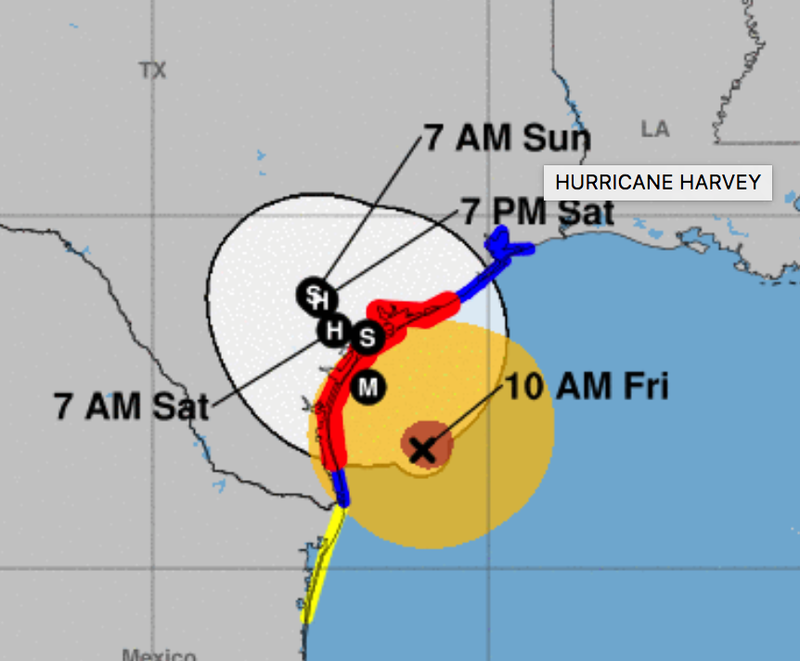 M=major hurricane, H=category 1 or 2 hurricane, S=tropical storm. 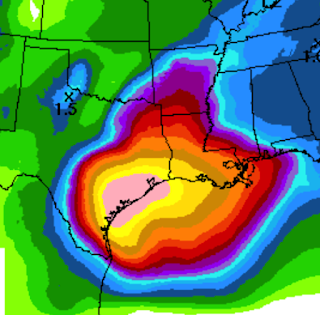 Almost indescribable flooding will occur. 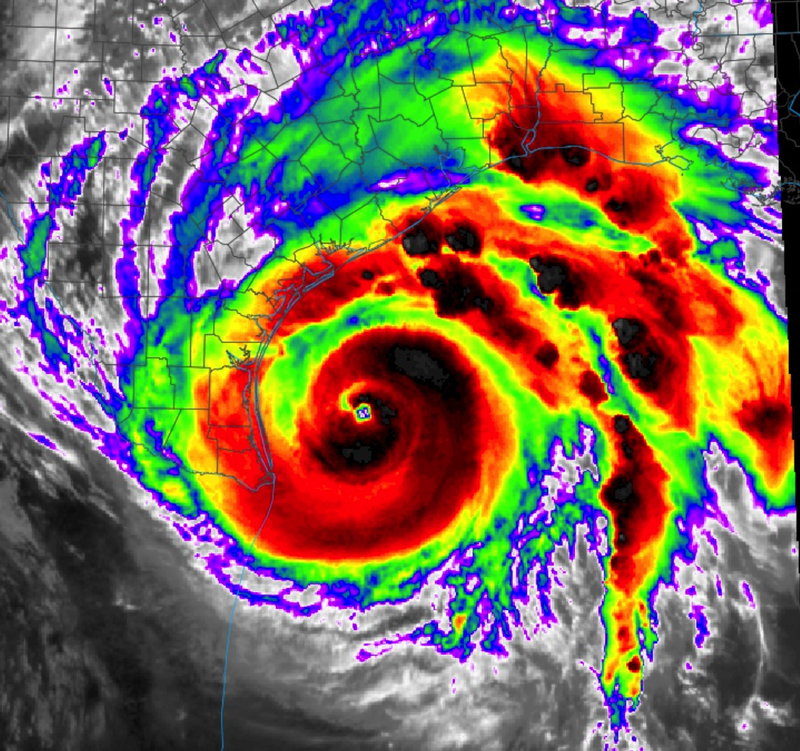 Between the winds and flooding, parts of the Texas coastal region will be without power and all but uninhabitable for days and, perhaps, weeks. It will be weeks before the rivers, which will exceed previous records, go below flood stages. Some spots may get 40 inches of rain in the pink area. Tornadoes are possible beginning late this afternoon with the threat continuing through at least Saturday. There are a number of good lists out there. Here are my suggestions. Get them done immediately! Whether you evacuate or not, stockpile some good books, magazines, board games and keep a good attitude. Look at this as one of life's adventures. There is nothing wrong with a few prayers!! Meteorologists with AccuWeather and with the National Weather Service are putting in incredible hours and dealing with incredible stress due to the extremely high stakes with this storm. Insurance companies are already pre-staging people and material to help their policyholders recover from the storm.